Microsoft has announced the implementation of advanced malware detection and protection coming to its webmail service, Outlook.com with additional protection for sharing and reading of files stored on the cloud service, OneDrive. While the most common malware attack is now the ransomware which infected PCs spread from file to file, thereby encrypting the documents stored on the machine and the bad guys will demand that you pay a stipulated amount of money for the digital key to decrypt the files. 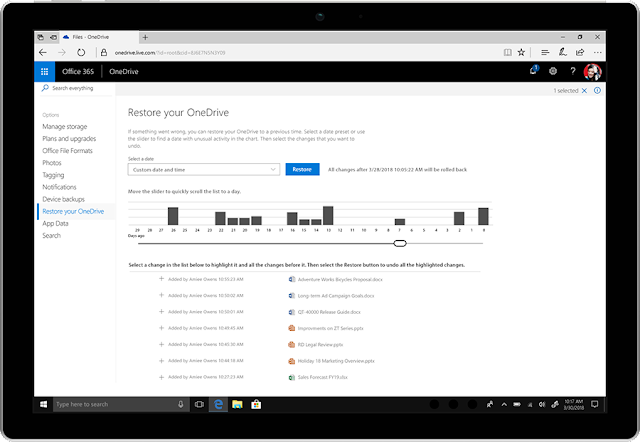 Microsoft have added the ability to “roll back” the files stored in OneDrive to older versions of the same file up to a month ago, in order to help in the recovery of the lost files and return it to the state it were before the malware attack. It was made possible through the Microsoft's automated threat-detection systems which helps to figure out the point at which the ransomware attack stated, and it alert the users on their mobile that an infection has been detected. And it will notify you of possible infections by any of the pre-selected channels that Microsoft normally use to contact you, like: popup notification, email or text messages. According to Kirk Koenigsbauer, the corporate vice president for Microsoft Office, with the growing presence and sophistication of online threats like viruses, ransomware, and phishing scams, it’s increasingly important to have the right protection and tools to help protect your devices, personal information, and files from being compromised. Microsoft is pitching its cloud storage service, OneDrive as the solution to ransomware attacks: given that when you upload your critical files before your PC gets infected, you’ll still be able to access all your files, albeit an older uninfected version. The Files Restore capability was previously only for OneDrive for Business customers and now extended to Office 365 subscriptions for home users. Though, the Outlook protection is not yet available to the Office 365 version of Outlook.